Rejoice! It's Lent. Sounds strange doesn't it? 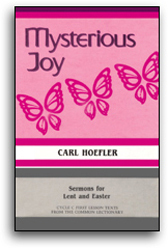 Joy and Lent just do not seem to go together. Lent is the somber season. In popular practice Lent possesses all the marks of a six-week funeral. The paraments are the deep purple of a dowager's dress. Hallelujahs are silenced within the service of the liturgy. Social celebrations are cancelled - or at least curtailed. Our attention is focused exclusively on the crucified body of a young man dying in agony on a criminal's cross. Our emotions are moved to tears by such words as suffering, sacrifice, passion, and death.